During one of my late night very early morning blogging sessions, I decided to take a break from writing up an article and check on my twitter account and see if anything new was going on. 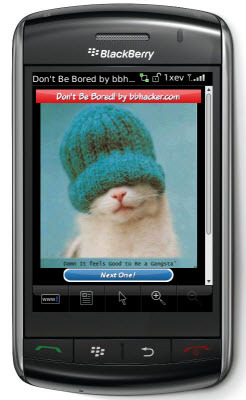 I came across a tweet by one of my followers @BBHacker who had just posted a link to an application he had created entitled "Don't Be Bored." The title alone interested me so I downloaded it and installed it. The application, prefectly titled by the way, is a small one which really is just a launcher for the site, redirects you to www.bbhacker.com/dbb which is a collection of random and hilarious images from around the internet, for me it was the perfect little time waster. It took up no space on my BlackBerry and amused me so much that I just has to tweet the image that made me chuckle. Overall, awesome fun and compatible for every BlackBerry 4.2+ OS!